We love burgers here at Lazy Oaf, in fact you could even say we were a bit obsessed. So today we've decided to take that obsession to the next level by teaming up with the ultimate burger critic and detective Burgerac for a once in a life time competition. We're giving you the chance to win a whole selection of our fast food favourites so read on to find out how. PRIZES TO BE WON! Items up for grabs include our French Fries Tote Bag (currently sold out! ), Burger Socks, Burger Passcase, Burger Locket Necklace and of course, our limited edition Lazy Oaf X Burgerac T-shirt (in your chosen size). To be in with a chance of winning this bumper burger prize we're simply asking you to tell us about your DREAM BURGER. We want to know everything including the fillings, sauce, size and most importantly, the name. To enter please post your answers as a comment to this blog post including your name and email address. Alternatively you can submit a drawing or photograph of your dream burger by emailing press@lazyoaf.com & burgeracblog@gmail.com. You can also enter via Twitter by submitting your answer to @lazyoaf and @burgeracblog using #dreamburgercomp. The competition closes on Monday 12th March where we will pick one lucky winner and present them on the blog. 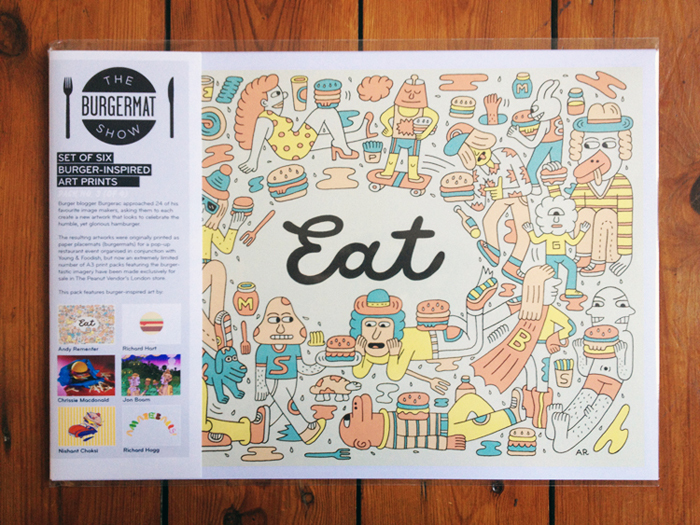 BURGERMAT PRINT PACK Burgerac will also be treating the winning answer to a limited edition set of six burger-inspired art prints from the Burgermat Show including designs by Andy Rementer, Richard Hart, Chrissie Macdonald, Jon Burgerman, Nishant Choksi and Richard Hogg. That means we've got over Â£100 worth of prizes to be won! So what would your dream burger be? We really do want to know. The competition will also be running simultaneously over at www.burgerac.com.